Kelly Clarkson has a budding hit on her hands with “Broken & Beautiful.” Her first of several contributions to the UglyDolls soundtrack features a writing assist from Pink and production from Marshmello and Steve Mac. That alone was enough to guarantee it would be a massive smash with plenty of replay factor. But it’s also a rousing anthem with a seriously uplifting message. “I know I’m Super Woman, I know I’m strong, I know I’ve got this ’cause I’ve had it all along. I’m phenomenal, I’m enough, I don’t need you to tell me who to be,” she declares. And the bop only gets bigger moving into the chorus. “Can someone just hold me? Don’t fix me, don’t try to change a thing. Can someone just know me? ‘Cause underneath I’m broken and it’s beautiful.” With growing support at radio and an upcoming performance at the 2019 Billboard Music Awards, the single is really picking up steam. And it gets yet another boost from the just-released music video. Out today (April 25), it features cameo appearances from Kelly’s daughter River Rose as well as Moxy – a character Kelly voices in the UglyDollsmovie. We’re also treated to an UglyDolls version of Marshmello, which is seriously too cute for words. All things considered, the feel-good video is an absolute must-see as we move into the back half of the week. Give it a view below. It looks increasingly likely that we will get a new single from Taylor Swift on Friday (April 26). The 29-year-old has been teasing that date on her social media accounts for the last couple of weeks, along with a selection of pastel-colored images. Radio stations have now started adopting a similar color scheme and Hits Daily Double is reporting that Republic has started previewing the song to a select group of tastemakers in the media. (My invitation must have been lost in the mail). According to HDD, unusual security measures are being taken against spoilers. “Programmers must listen to the track on headphones via a device that never leaves the possession of the label team,” the reveal. Not only that, but “[they] must sign an NDA enjoining them not only not to discuss the content of the song but to deny its very existence.” I’m very ready for Taylor’s new era. The soft and pretty color palette suggests a less abrasive approach than Reputation, and she is the undisputed queen of the zeitgeist-commanding lead single. Bring it on! La Reina del Pop, que está más que estupenda, y Maluma vienen dispuestos a provocar y hacerlo a lo grande, con un tema que contiene la esencia más pura de cada uno de ello, lo que hace que se convierta en una mezcla explosiva y casi difícil de catalogar. Eso sí, el vídeo es todo un despliegue de medios visuales, con una estética propia de la cantante en la que el colombiano, a pesar de todo, es un secundario frente a una Madame X que derrocha besos, movimientos sinuosos y desparpajo, entre mucho fetichismo y estimulantes varios. Las eróticas escenas entre la cantante de 60 años y el colombiano de 25 han provocado un debate en redes sociales .Aunque el tema había provocado reacciones polarizadas y memes, el videoclip donde los cantantes bailan y se casan detonó en comentarios positivos en su mayoría. Hurts 2B Human (due April 26) is shaping up to be one of Pink’s best, and most surprising, albums. The veteran hitmaker kicked it off with the anthemic “Walk Me Home” and then showcased her versatility by rocking out on “Hustle” and then leading us to the dance floor with nostalgic club-banger, “Can We Pretend.” She now switches it up again, joining forces with the prolific, always-brilliant Khalid for the soulful title track. Yes, this mellow bop might be the closest Alecia has come to R&B since her debut LP. While this sounds like an unlikely collaboration on paper, it comes together brilliantly. Take a listen below and then watch Pink slay The Ellen DeGeneres Show at the bottom of the post. The Jonas Brothers staged an epic comeback in March when “Sucker,” their first single in six years, topped the Billboard Hot 100. The iconic trio would be forgiven for resting on their laurels for at least a couple of weeks, but they are determined to keep the Jo Bros revival in full swing. 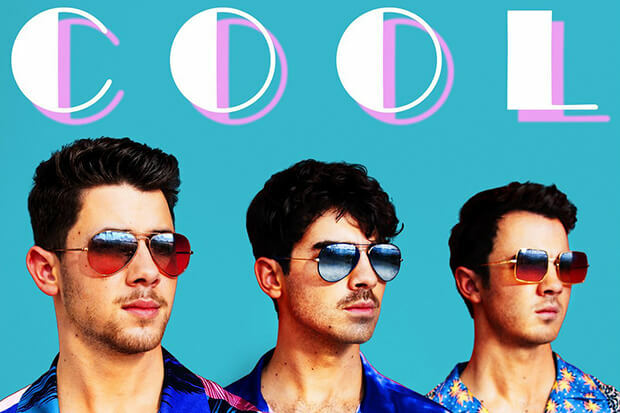 The band’s next single is called “Cool” and it drops on Friday (April 5). It will be interesting to see if “Cool” generates as much love as “Sucker.” There was definitely an element of nostalgia in that song’s success, but it will soon dissipate if they don’t keep delivering A-grade pop/rock. Not that fans should be too concerned. The Jonas Brothers are working with all the best songwriters and producers (Ryan Tedder, Frank Dukes and Louis Bell) and seem intent on making their comeback last. With any luck, the guys will announce the title and release date of their fifth LP in the coming weeks. See the cover of “Cool” below. Elle Fanning is one of those annoying people that is good at everything. Whether she’s starring in arthouse fare like The Neon Demonand The Beguiled, or blockbusters like Maleficent, the 20-year-old is never less than utterly captivating. It turns out, she’s also a rather handy singer. Elle shows off her vocal chops in the upcoming Teen Spirit (in theaters April 12) — a film about a British school girl with a passion for pop and the drive to escape from her small, claustrophobic town. Elle cuts the emotional chord on the bittersweet chorus. “Wildflowers you brought me are crumbled in my hands,” she laments. “I killed them, you caught me — the stain is on my hands.” The track was co-written by Carly Rae Jepsen, Jack Antonoff and Tavish Crowe, and wouldn’t sound out of place on the Canadian pop star’s E·MO·TION LP. And that’s high praise indeed! Check out “Wildflowers” below and pre-order the soundtrack here. The pop/rocker relaunches with a new single called ‘Walk Me Home’ and it’s a gem. Pink has been serving iconic visuals since the turn of the century (“There You Go” and “Most Girls” are modern art), but I think she just delivered her best one yet. Directed by The Greatest Showman’s Michael Gracey, the pop/rocker’s “Walk Me Home” visual is a love letter of sorts to movie musicals like Singing In The Rain. It finds the hitmaker dancing her way along empty streets with a little help from shadow partners. The clip makes good use of Pink’s legendary acrobatic skill and has a timeless quality that is startling in the age of throwaway video clips. Pairing a killer song with a fully realized, fitting visual concept is no easy feat, but Pink makes it look easy. There’s every chance this video will go viral, which will only help to propel “Walk Me Home” up the charts. And, hopefully, open the hearts (and minds) of youth-obsessed pop radio programmers. In addition to dropping a poetic video, the 39-year-old also confirmed the release date of Hurts 2B Human. The pop icon’s 8th studio album arrives on April 26 and is destined to be one of the year’s biggest sellers. 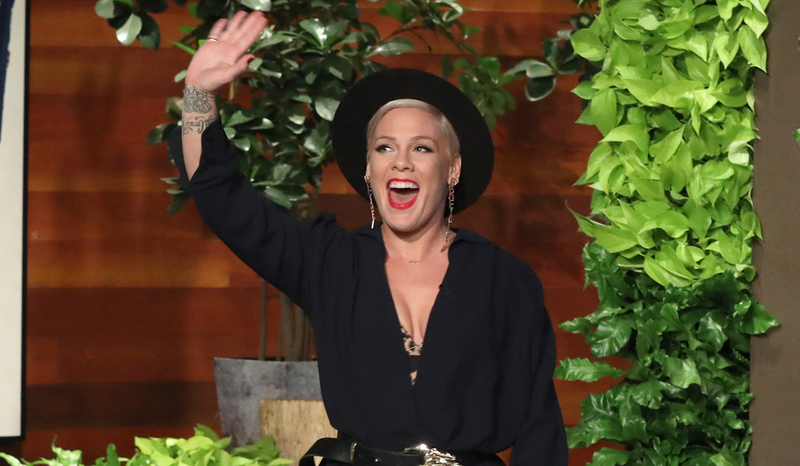 Pink’s new single ‘Walk Me Home’ will be out in a couple of weeks. The ‘Just Give Me A Reason’ hitmaker dropped a huge bombshell about new music as she made an appearance on ‘The Ellen DeGeneres Show’ on Wednesday (06.02.19) and she also confirmed her new LP, ‘Hurts to Be Human’, will be out in April. ‘Hurts to Be Human’ will be Pink’s first studio album since 2017’s ‘Beautiful Trauma’ and the singer previously revealed she credits her broad appeal to being a «hot mess». And Pink had previously opened up about how she got the inspiration for the title of her album ‘Beautiful Trauma’. She said at the time: «I think life is really traumatic, and it feels – even though it makes me sound like my parents to say this – it feels like it’s getting more so. But I also think that there’s really beautiful people in the] world. And there’s more good than bad. And there’s love to be made and joy to be had. And I try to hold on to the beautiful part. Katy Perry & Zedd’s “365” Sounds Like A Massive Hit! The wait is over! Rumors have been swirling about Katy Perry and Zedd’s pop-saving collaboration for months now. It all started when the “Happy Now” hitmaker hopped on WITNESS: The Tour in late 2018. However, those rumors picked up speed last month after the duo registered a track called “365” with Universal Music Publishing Group. Since then, anticipation has been sky-high to hear what they cooked up in the studio. Today (February 14), it is finally out! And it sounds like a potentially massive hit. Boasting an addictive production and sugary sweet lyrics, the single is perfectly tailored for a Valentine’s Day release. “Waking up next to you in the middle of the week. Never needed anyone to send me off to sleep. And I know I said go slow, but I can’t hold back no more,” Katy sings. She falls even deeper in love on the chorus. “Are you gonna be the one that’s on my mind? 365, all the time? I want you to be the one to stay. You give me the night and day.” That sentiment takes on a different connotation in the accompanying video, which plays with concepts of love and obsession. In the Warren Fu-directed release, the “Bon Appetit” diva is an android who develops feelings for the very-human Zedd. There are some twists and turns, all of which build up to a heartbreaking ending. Basically, it is essential viewing. Zedd opened up how the song came about in a press release. “Katy and I have known each other for a while now and while on tour together in Australia last summer, we started working on some music,” he explained. “After we got off tour and with our musical value systems even more aligned we continued working together and that’s when ‘365’ started to take shape. As it all came together, we knew we had something special.” Katy echoed his message. “I was really excited for Zedd to join my WITNESS: The Tour last year, and in our down time, we started vibing on music, which led to this special song.” Check it out below! It has been a wild week for Cardi B. The Rap Empress kicked things off on an incredible high after making history at the Grammys. During the show, she delivered a suitably eye-popping rendition of current single “Money” and served a look on the red carpet. However, her night got even better when she picked up the Grammy for Best Rap Album. The accomplishment makes her the first female rapper to win the category as a solo artist. However, shortly after delivering her (iconic) acceptance speech, people began complaining that she didn’t deserve the honor. After defending herself on Instagram, the 26-year-old disabled her account for a while to escape the hate. However, she didn’t let the naysayers keep her down for long. Instead, she ended her “retirement” early to announce a new collaboration with fellow Grammy winner Bruno Mars. The duo linked up on last year’s retro “Finesse (Remix),” which hit the number 3 spot on the Billboard Hot 100. And it seems safe to assume that they have another massive hit on their hands with their latest – “Please Me.” Boasting production from Bruno and The Stereotypes, it’s a sensual bop. The “That’s What I Like” crooner shows off his velvety vocals on the seductive chorus. “Please me, baby. Turn around and just tease me, baby,” he pleads. Meanwhile, Cardi’s verses are as self-assured and smooth as ever. Hopefully a video follows very soon. After the vibrant, mega-viral release that accompanied “Finesse (Remix),” I’m dying to see what they have in store this time around. In the meantime, press play on “Please Me” below!